How can i open that file, i dont have any program to open it, and inside.... what i have to do? i want to put the resolution of HDMI 1920x1080. Because if you don't the patch does not install correctly. Anyway, the folder rebuilds itself the next time the program is run, and it has nothing to do with screenshots. If it affects your screenshot ability, you probably did something wrong with installing the patch. I download SE from the web, i extract in a folder....., then i download 0.9.6.2 and i extract it in the same folder and i overwrite some files. When i finish doing that theres no cache folder. I run the SE and all works good. Ok you did it correctly then. I am having difficulty finding dim stars, like I really want to look at M4, M5 spectral class ones, and Red Giants of various sorts. 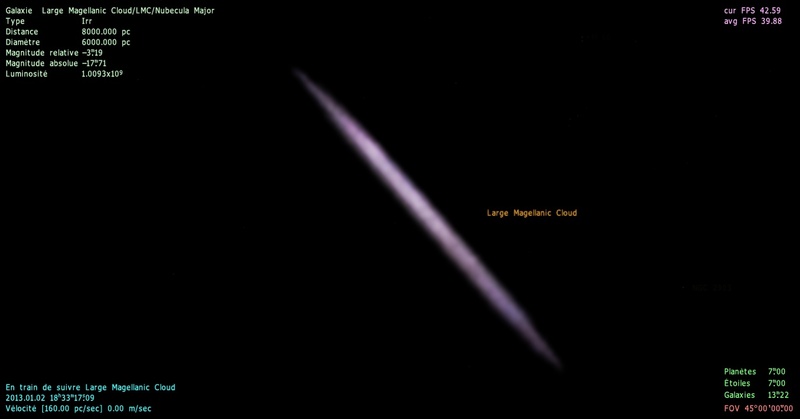 For now I am pretty much random clicking and reading the spectral class in the top left corner, and I'm trying to skirt the edge of a galaxy with increased magnitude limit to make them easier to spot. Any tips on how to find the dimmest stars? 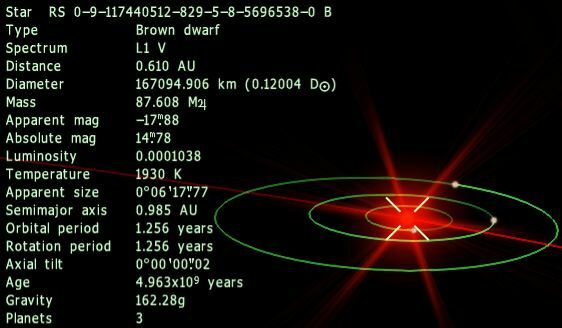 Are there any brown dwarfs? Use the map mode (F1 key) You can even find black holes this way. There is a bug reports thread where you can submit bugs. Anyway, that bug is already known. Thank you, this does work very well for the very dim spectral class M ones, and brown dwarfs and black holes as you mention. I am also interested in the Red Giant stars. They are fairly bright, but if I lower magnitude there's a ton of blue stars. Any good way to single out Red Giants? Since last month, I'd often spend time on SE, searching for a lone brown dwarf. I hanv't found one yet. But, everytime when I saw a brown dwarf, it is associated with a neutron star or a black hole. 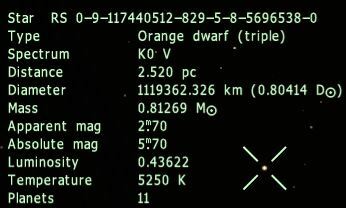 The must I have found is 2 brown dwarves orbiting each other. Is this a bug ? Does lone brown dwarfs are as rare as this in the universe ? This may be a bug. I'm not sure if 0.96 can generate alone BD, but 0.97 should do it. Does lone brown dwarfs are as rare as this in the universe ? I've seen 1. 1. That's it. Just 1. Extremely difficult to find, even in map mode, not only because they're rare but because they are so dim. Extremely difficult to find, even in map mode, not only because they're rare but because they are so dim. Are Magellanic clouds as flat as they are represented in SE ? Nah, they are way too flat in SE. Their true shape is irregular. No, but trying to get more depth into them with SE would be difficult at present. Their true shape is irregular. Well, yes and no. The LMC for example is thought to be a disrupted spiral galaxy, and still maintains characteristics of such a galaxy, including a (probably rather warped) disk structure with bar and partial arms, and much of the galaxy is probably still arranged around that planar structure. But much of it has also been pulled into an irregular shape via tidal interactions with the Milky Way and SMC. So it's essentially an irregular spiral. Such galaxies are sometimes referred to as "Magellanic Spirals", listed as Sm (or SBm) on the De Vaucouleurs system, which denotes a discernible spiral structure with an irregular appearance and no central bulge. Specifically, the LMC is SB(s)m, which means it has a barred spiral structure with no ring, irregular in appearance with no central bulge. 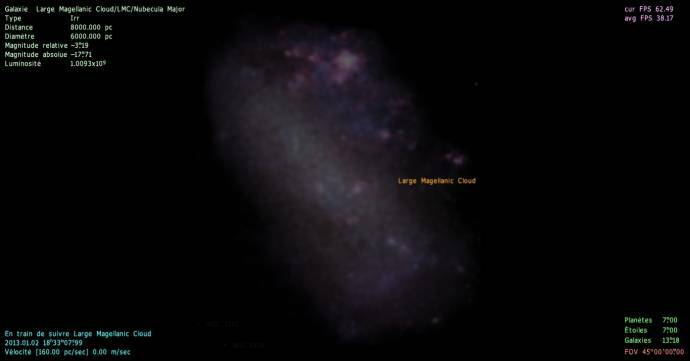 The SMC on the other hand is simply classed as Irr, a highly irregular galaxy. I have found a triple star system consisting of two orange dwarf stars and a brown dwarf star. The total amount of planets should (according to each individual star's statistics) be 33 planets! I have manually checked the orbits and there are 11 planets total in this system, 2 orbiting the barycenter of AA & AB, 3 orbiting the brown dwarf star and the remaining 6 outer planets orbiting the barycenter of all three stars. I am running SpaceEngine 0.9.6.2. No mods has been installed other than that I have downloaded and added the high resolution packages of Earth, Jupiter's Galilean moons, Mars, Mercury and the moon as available in the downloads section. 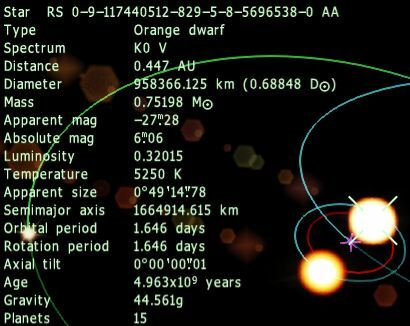 Find attached my se.log showing that it successfully generated all the 148 objects of this star system. You know, I've noticed that SE sometimes puts the stars into the number or planets. For example, look at a hot blue binary that doesn't actually have planets, the planets won't show as 0, it shows as 2. Same for stellar remnants that don't have a regular star as a companion. Here, what probably happened is that it somehow counted the stars as planet objects or it counted twice and added.